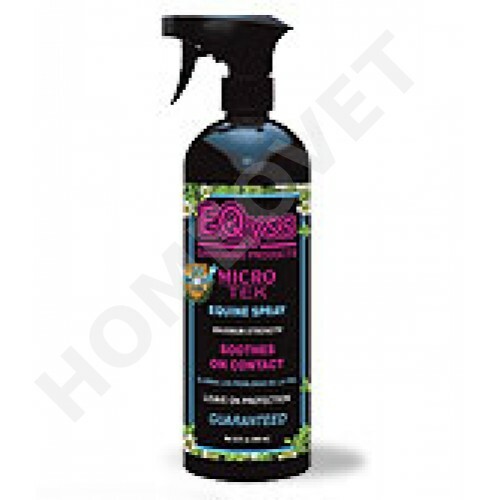 An excellent spray for dogs and cats, The fast-acting formula of Micro-Tek Pet Shampoo provides a healthy environment for healing, giving effective relief against a variety of skin conditions, including flea bites, dermatitis, seborrhea, hot spots and dry itchy skin. Micro Tek stops biting and licking immediately and is effective for 24 hours. Can be sprayed directly on affected areas. Gentle care formula causes no burning, and promotes the healing of wounds. Very well tolerated and long-term proven formula. spray once a day directly onto the affected skin. As long as apply until the problems are gone. Possibly in combination with Eqyss Micro Tek medicated shampoo.